It’s never going to be a bad thing having Iron Maiden as your dad. For ‘next generation of new wave of British heavy metal’ band The Raven Age, the Maiden connection is with guitarist and founding member George ‘son of Steve’ Harris. 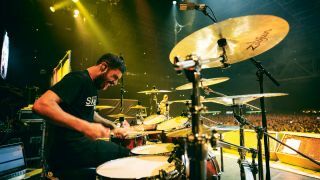 But Harris Jr has been supported from the band’s 2009 inception by drummer Jai Patel, who has been able to watch the great Nicko McBrain up close and take his cues from the heavy metal drum legend as The Raven Age supported Maiden on their Book Of Souls tour. But make no mistake, The Raven Age are undoubtedly metal stars in their own right. Check out Jai’s playing on ‘The Promised Land’ from their debut album Darkness Will Rise to sample Jai’s own very tasty metal chops for yourself. How did you come to hook up with The Raven Age? You’ve played with some pretty huge metal heroes - what was it like supporting Maiden and what have their fans been like? What are Iron Maiden like - have you had any pointers from Nicko? 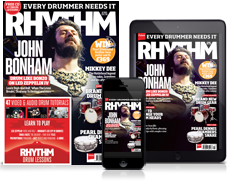 Who were your drumming heroes when you started out playing? Which The Raven Age song perfectly captures your sound and style? What was the first kit you ever owned?